4/19/19 Taekyu Joo was selected as the recipient of the Doug Davis Fellowship. Congrats Taekyu! 3/28/19 Laura Yang has been selected as a recipient of a President’s Undergraduate Research Salary Award (PURA) for Summer 2019. Congrats Laura! 3/18/19 Laura Yang received the Buck Stith Outstanding Junior Award in Environmental Engineering. Congrats Laura! 1/7/19 Laura Yang and Adam Wright join the group as undergrduate researchers. Welcome Laura and Adam! 10/31/18 Weiqi Xu joined the group as a visiting student. Weiqi is a PhD student in Yele Sun's group at the Institute of Atmospheric Physics (IAP), Chinese Academy of Sciences (CAS), China. Weclome Weiqi! 10/28/18 Dr. Ng presented at AICHE annual meeting in Pittsburgh. 10/14/18 Ng group members attended and presented at AAAR, including Yunle, Gamze, Masayuki, Taekyu, Thomas, and Sally. 8/20/18 Josh Whitley joined the group as an undergraduate researcher. Welcome Josh! 8/8/18 Yunle received a Student Travel Grant from AAAR. Congrats Yunle! 7/12/18 Dr. Jean Rivera Rios joined the group as a Camille and Henry Dreyfus Environmental Chemistry Fellow. Jean received his PhD from Harvard University. Welcome Jean! 7/10/18 Our group developed a “Particulate Matter and Air Pollution” outreach program for middle school students and hosted a teacher training workshop this week! 7/6/18 Group lunch for Thomas' farewell. 4/21/18 Dr. Ng was featured in the Hong Kong Jockey Club Scholarship 20th Anniversary Commemorative Book. Read more here. 4/20/18 Alec received a Honorable Mention in the 2018 Air Products Undergraduate Research Symposium. Congrats Alec! 3/16/18 Group dinner to celebrate Wing's PhD. 3/6/18 Wng Tuet successfully defended her PhD thesis! The title of Wing’s thesis is “Cellular and acellular assays for measuring oxidative stress induced by ambient and laboratory-generated aerosols”. Congrats Dr. Tuet! 2/15/18 Dr. Ng was quoted by The Washington Post on everyday chemcials as a source of air pollution. Read more here. 2/1/18 Dr. Fobang Liu joined the group as a postdoc (co-advised by Dr. Hang Lu). Fobang received his PhD from Max Planck Institute for Chemistry Mainz, Germany. Welcome Fobang! 1/23/18 Dr. Ng Wins Award from Dreyfus Foundation. Read more here. 12/15/17 Dr. Ng gave an invited talk at the American Geophysical Union (AGU) conference in New Orleans. 12/7/17 Dr. Ng gave an invited talk at the International Aerosol Modeling Algorithms (IAMA) Conference at UC-Davis. 12/6/17 Dr. Ng named among the world's most highly cited researchers. Read more here. 11/15/17 Alec Hendrix received an Air Products Undergraduate Research Award. Congrats Alec! 10/31/17 Dr. Ng presented at AICHE annual meeting in Minneapolis. 10/16/17 Ng group members attended and presented at AAAR, including Wing, Yunle, Gamze, Masayuki, Taekyu, Thomas, Dao, and Sally. Masayuki and Gamze both received a Student Travel Grant from AAAR. Congrats! 8/22/17 Alec Hendrix joined the group as an undergraduate researcher. Welcome Alec! 8/21/17 Gabriela Saavedra joined the group as a MS student. Welcome Gaby! 6/29/17 Steve Kim has been selected as a recipient of a President’s Undergraduate Research Salary Award (PURA) for Fall 2017. Congrats Steve! 6/22/17 Dr. Thomas Berkemeier received the Otto Hahn Medal of the Max Planck Society. Read the press release. Congrats Thomas! 5/31/17 Dr. Ng gave an invited talk at the Canadian Chemistry Conference in Toronto. 5/22/17 Mariana Rivas joined the group as a REU student this summer. Mariana is an undergraduate student at UC Berkeley. Welcome Mariana! 5/1/17 Dr. Lu Xu and Dr. Thomas Berkemeier were selected as ACCESS XIV participants at the 2017 GRC in Atmospheric Chemistry. Congrats Lu and Thomas! 4/30/17 Dr. Ng presented at the Health Effects Institute Annual Conference in Alexandria. 3/16/17 Dr. Lu Xu has been selected to receive the Sigma Xi Best Ph.D. Thesis Award from Georgia Tech. Congrats Lu! 3/3/17 The group goes to Dave and Buster's to celebrate tenure, followed by dinner for Lu's farewell! 11/22/16 Dr. Ng is appointed to the Editorial Board of the Journal of Aerosol Science. 11/14/16 Ng group attended AIChE annual meeting in San Francisco. James Rowe won the 1st place undergraduate poster award in Environmental Science & Engineering at AIChE. Congrats James! 10/21/16 Steve Kim received an Air Products Undergraduate Research Award. Congrats Steve! 10/20/16 Dr. Ng co-organized a special symposium on “Effects of NOx and SO2 on BVOC Oxidation and Organic Aerosol Formation” at AAAR. Read more here. 10/17/16 Ng group members attended and presented at AAAR, including Lu, Wing, Yunle, Gamze, and Sally. 10/15/16 Dr. Lu Xu's paper "Enhanced formation of Isoprene-derived Organic Aerosol in Sulfur-rich Power Plant Plumes during Southeast Nexus (SENEX)" was published in the Journal of Geophysical Research. Congrats Lu! 10/10/16 Professor Dao Huang joined the group as a visiting scholar. Professor Huang is an assistant professor in the School of Earth Sciences at Zhejiang University, China. Welcome Professor Huang! 10/2/16 James Rowe was selected as an undergraduate researcher to represent Georgia Tech at the 2016 AIChE Annual Student Conference. Congrats James! 9/23/16 Dr. Lu Xu was selected to attend the IGAC Early Career Program. Congrats Lu! Read more here. 9/6/16 Dr. Thomas Berkemeier joined the group as a postdoc. Thomas is a receipent of the prestigious ChBE Postdoctoral Fellowship. Thomas received his PhD from Max Planck Institute for Chemistry and Johannes Gutenberg University Mainz. Welcome Thomas! 9/4/16 Wing Tuet's paper "Dose-dependent intracellular reactive oxygen and nitrogen species (ROS/RNS) production from particulate matter exposure: comparison to oxidative potential and chemical composition" was published in Atmospheric Environment. Congrats Wing! Link to the article. 8/26/16 James Rowe joined the group as an undergraduate researcher. Welcome James! 8/22/16 Taekyu Joo joined the group as a PhD student. Welcome Taekyu! 8/19/16 Javier Sanchez's paper "A new technique for the direct detection of HO2 radicals using bromide chemical ionization mass spectrometry (Br-CIMS): initial characterization" was published in Atmospheric Measurement Techniques. Congrats Javier! Link to the article. 8/5/16 Group dinner to celebrate Javier's MS and welcome Sandy. 7/28/16 Dr. Theo Nah's paper "Influence of seed aerosol surface area and oxidation rate on vapor wall deposition and SOA mass yields: a case study with α-pinene ozonolysis" was published in Atmospheric Chemistry and Physics. Congrats Theo! Link to the article. 7/25/16 Javier successfully defended his MS thesis. Congrats Javier! 7/5/16 Dr. Sandra Blair joined the group as a postdoc. Sandy received her PhD from UC Irvine. Welcome Sandy! 6/20/16 Masayuki Takeuchi joined the group as a PhD student. Welcome Masayuki! 6/20/16 Steve Kim joined the group as an undergraduate researcher. Welcome Steve! 6/3/16 Group dinner to celebrate our two recent PhDs. Congrats Lu and Chris! 5/31/16 Chris Boyd successfully defended his PhD thesis! Chris’ thesis title is “Formation and fate of secondary organic aerosol produced from nitrate radical oxidation of monoterpenes”. Congrats Dr. Boyd! 5/24/16 Lu Xu successfully defended his PhD thesis! Lu is the first PhD from the Ng group. The title of Lu’s thesis is “Effects of anthropogenic emission on biogenic organic aerosol formation in the southeastern United States”. Congrats Dr. Xu! 5/23/16 Yi Ji passed the ChBE PhD comprehensive qualifying exam. Congrats Yi! 5/1/16 Dr. Ng presented at the Health Effects Institute Annual Conference in Denver. 3/15/16 Qiao Zhu joined the group as a visiting student. Qiao is a PhD student at Peking University (Shenzhen campus). Welcome Qiao! 3/1/16 Dr. Ng received the Sigma Xi Young Faculty Award from Georgia Tech! 2/2/16 Lu Xu won an Environmental Chemistry Graduate Student Award from ACS. Congrats Lu! 2/2/16 Lu Xu’s paper “Wintertime aerosol chemical composition, volatility, and spatial variability in the greater London area” was published in Atmospheric Chemistry and Physics. Congrats to Lu! Link to the article. 2/1/16 Dr. Ng received a NSF CAREER award! Read more here. 1/20/16 Gamze Eris passed the ChBE PhD comprehensive qualifying exam. Congrats Gamze! 1/13/16 Lu Xu won an Outstanding Paper Award from AGU for “Aerosol characterization over the southeastern United States using high-resolution aerosol mass spectrometry: spatial and seasonal variation of aerosol composition and sources with a focus on organic nitrates,” published in Atmospheric Chemistry and Physics. Congrats Lu! Link to the article. 12/17/15 Dr. Ng co-orgnaized a town hall meeting at AGU on "Nitrate Radicals and Biogenic Volatile Organic Compounds". 12/14/15 Ng group (Lu, Theo, Sally) attended and presented at AGU in San Francisco. 11/30/15 Dr. Theo Nah’s paper “Photochemical Aging of alpha-pinene and beta-pinene Secondary Organic Aerosol formed from Nitrate Radical Oxidation” was published in Environment Science and Technology. Congrats Theo! Link to the article. 11/8/15 Dr. Ng presented at AICHE annual meeting in Salt Lak City. 10/12/15 Ng group members attended and presented at AAAR, including Lu, Chris, Javier, Wing, Theo, and Sally. 10/7/15 Shierly Fok received an Air Products Undergraduate Research Award. Congrats Shierly! 10/1/15 Gamze Eris and Yi Ji joined the group as PhD students. Welcome Gamze and Yi! 9/9/15 Lu Xu won first place in this year's AIChE Environmental Division Graduate Student Paper Award competition. Congrats Lu! 8/19/15 Dr. Ng gave an invited talk at the American Chemical Society Fall Meeting in Boston. 8/17/15 Yunle Chen joined the group as a PhD student. Welcome Yunle! 7/10/15 Chris Boyd’s paper “Secondary organic aerosol formation from the beta-pinene+NO3 system: effect of humidity and peroxy radical fate” was published in Atmospheric Chemistry and Physics. Congrats Chris! Link to the article. 7/8/15 Lu Xu’s paper “Aerosol characterization over the southeastern United States using high-resolution aerosol mass spectrometry: spatial and seasonal variation of aerosol composition and sources with a focus on organic nitrates” was published in Atmospheric Chemistry and Physics. Congrats Lu! Link to the article. 6/30/15 Wing Tuet defended her PhD proposal. Congrats Wing! 6/29/15 Javier Sanchez defended his PhD proposal. Congrats Javier! 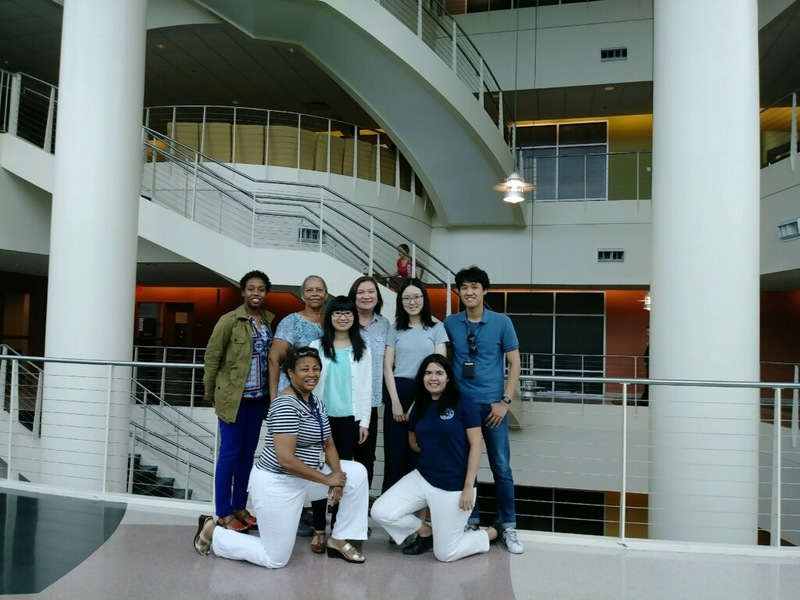 6/22/15 Dr. Ng co-organized a workshop on “Nitrate Radicals and Biogenic Volatile Organic Compounds: Oxidation, Mechanisms, and Organic Aerosol” at Georgia Tech. Workshop details here. The workshop is also featured in IGACnews, read here. 6/15/15 Shierly Fok and Masayuki Takeuchi joined the group as undergraduate researchers. Welcome Shierly and Masayuki! 5/27/15 Javier Sanchez received a NASA Earth and Space Science Fellowship. Congrats Javier! 5/10/15 Group gathering to welcome Samara. Samara made Brazilian food! 5/8/15 Dr. Theo Nah was selected as an ACCESS XIII participant at the 2015 GRC in Atmospheric Chemistry. Congrats Theo! 5/3/15 Dr. Ng presented at the Health Effects Institute Annual Conference in Philadelphia. 4/21/15 Dr. Ng gave an invited talk at the Engineering Sustainability Conference in Pittsburgh. 4/2/15 Dr. Samara Carbone joined the group as a visiting scholar. Samara came to us from the University of Sao Paulo. Welcome Samara! 3/31/15 Wing Tuet was award an NSF Graduate Student Fellowship. Congrats Wing! 1/6/15 Lu Xu’s paper “Effects of anthropogenic emissions on aerosol formation from isoprene and monoterpenes in the southeastern United States” was published in Proceedings of the National Academy of Sciences. Congrats Lu! Link to the article. Georgia Tech press release here. Also featured in Futurity and Phys.org. 12/15/14 Members of the group (Lu and Sally) head to AGU in San Francisco. 11/16/14 Ng group presented at the AIChE meeting in Atlanta. 10/20/14 Ng group attended the AAAR meeting in Orlando. Lu Xu and Chris Boyd both gave an oral presentation. 9/29/14 Zeyao Luan received an Air Products Undergraduate Research Award. Congrats Zeyao! 9/23/14 Lu Xu was awarded the 2014 Ziegler Best Proposal Award. Congrats Lu! 9/22/14 Lu Xu was awarded the 2014 Air and Waste Management Association – Georgia Chapter (A&WMA) Scholarship. Congrats Lu! 9/11/14 Dr. Ng’s paper “An Aerosol Chemical Speciation Monitor (ACSM) for Routine Monitoring of the Composition and Mass Concentrations of Ambient Aerosol” is highlighted as one of the 5 most-cited articles published in 2011-2013 in Aerosol Science and Technology. Link to the article. 9/8/14 Dr. Theodora Nah joined the group as a postdoctoral researcher. Theo received her PhD from UC Berkeley. Welcome Theo! 9/1/14 Dr. Ng and several other faculty members at GT (Weber, Nenes, Huey, Russell, Bergin) were awarded a Major Research Instrumentation (MRI) grant from NSF. Georgia Tech press release here. 8/22/14 Javier Sanchez was awarded an Alfred P. Sloan Minority Ph.D. (MPHD) Scholarship. Congrats Javier! 8/15/14 Chris Boyd successfully defended his PhD proposal. Congrats Chris! 4/23/14 Debra Wu gave a poster presentation at the Georgia Tech Undergraduate Research Symposium. 4/18/14 Siri Kore received a Honorable Mention at the Air Products Undergraduate Research Symposium. Congrats Siri! 3/31/14 Dr. Ng presented at the Health Effects Institute Annual Conference in Alexandria. 3/1/14 Dr. Ng received the Walter A. Rosenblith New Investigator Award from the Health Effects Institute! Read more here. 1/28/14 Lu Xu’s paper “Effects of NOx on the volatility of secondary organic aerosol from isoprene photooxidation” was published in Environment Science and Technology. Link to the article.